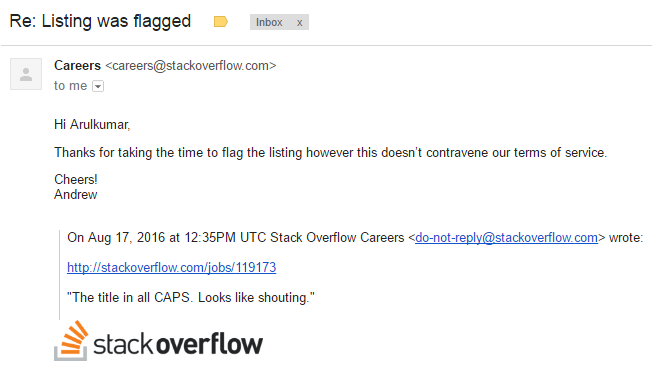 There is a job currently posted on Stack Overflow Jobs. Its title is in ALL CAPS. That makes it ugly and difficult to read. Is there a way to restrict that, so that the entire job title cannot appear in all caps? This is not a mission-critical bug, but it would be nice to have properly formatted mixed case titles that didn't look like they were screaming at you. This is why we offer a job flagging feature. Let us know about obnoxious titles in any format and we'll try to get them fixed. The original title in question here has already been improved. Anyway, thanks for bringing this up. As Juice said, we don't have any plans to change this functionality at this time. It's not because companies pay us. It's not because we want you to have a terrible experience. It's because a job posting is an expression of a company, and in the same way that we don't censor your profile (other than profanity and discrimination), we also don't want to censor their Job "profile" offered to you. Having said that, we do offer guidance to companies posting Jobs with us. We advise employers on the best way to structure their listings from various angles - grammar, writing style, content, ad targeting, etc. We're a "full service" job board, if you will. We want them to succeed and we want developers to get awesome jobs. But at the end of the day, it's still up to the employers to follow that advice. When they don't follow our advice, consider all caps, emoji, etc. an easy screener for you: if you don't like their style, you're probably unlikely to enjoy the job they offer as well. Right now we have no plans to force companies into "No all Caps compliance". We can make suggestions, and we do, but we're not going to turn away customers because of it. There are a lot of rules that we do enforce. Important ones such as spam and being upfront about being a recruiter or offering real remote work. I (and many of us) agree a title in all caps isn't great, but we have lots of battles to fight, and this isn't going to be one right now. Not the answer you're looking for? Browse other questions tagged discussion feature-request status-deferred jobs advertising .